I attempted to make ratatouille the other day in the pressure cooker. 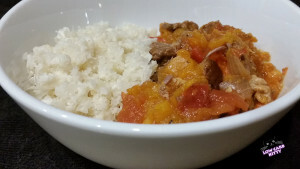 It came out OK – I ate it over cauliflower-rice. I’ll post the recipe here in case you want to try it, but note my modifications. 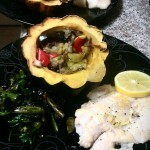 Took the ratatouille and served it in a baked acorn squash – now THAT was very tasty. 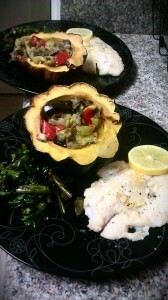 Also had parmesean encrusted tilapia and Chinese broccoli (complete with lil flowers!) sauteed in rice vinegar and garlic. NOMMAGE!!!! I re-appropriated the recipe from The Complete Idiot’s Guide to Pressure Cooking. Mom gave me this book (and The Pressure Cooker cookbook) along with the pressure cooker. I scoffed but honestly, this book is way better than the other one. 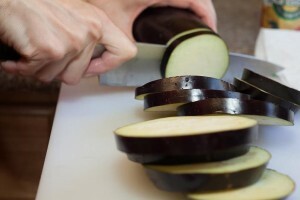 Slice up eggplant, lay on paper towels and sprinkle salt on the slices to 'sweat' out any bitterness. Let them hang out for at least 30 minutes. 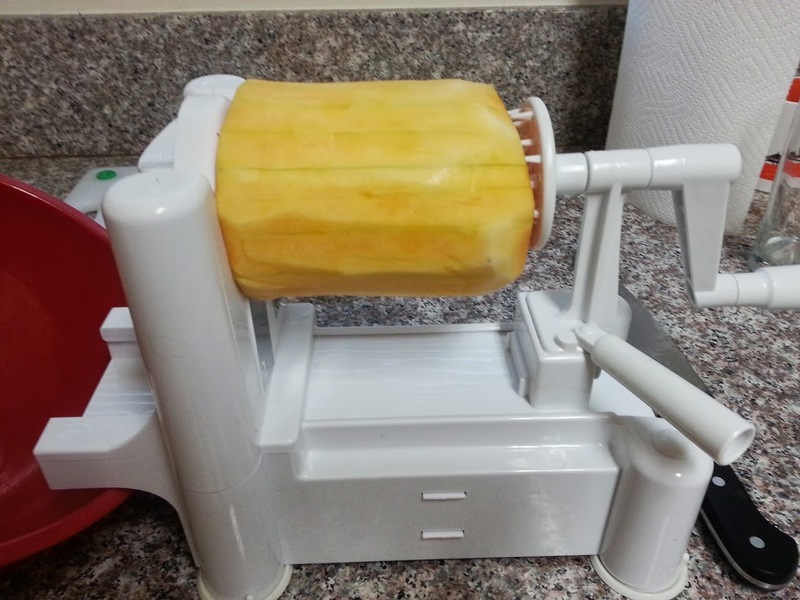 Wipe off the sweat n' salt with a paper towel and chop up into 2" pieces. While making your eggplant sweat it out in fear of the impending knife that will ultimately chop them up, show them what is to come by cutting up the squashes, tomatos, and radish into cubes. Place pressure cooker pot on stove top and set to medium heat - sautee onion and garlic in olive oil. Set aside. Sautee chopped eggplant and other veggies (might have to do this in a few batches) for about 3 minutes. Dump all veggies (including garlic, parsley and onions) into the pot. Put in at least 1 cup of chicken broth. So yeah. What came out was sort of ‘soggy veggie’ pile. I realized after the fact that squashes have a lot of water content. 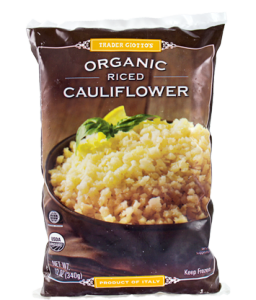 After serving it on top of the cauliflower rice, it was pretty good (eggplant gives it a nice, sweet taste). -Add more spices, like rosemary. Parsley is dumb and has no flavor. -Add LESS stock – 3 cups was just way too much. It was VERY soupy. I strained it all out. I’ll try again with one cup. -Use beef stock – mmmmm beef stock is just so much tastier than chicken stock. -Add sausage, a nice spicy flavorful sausage. 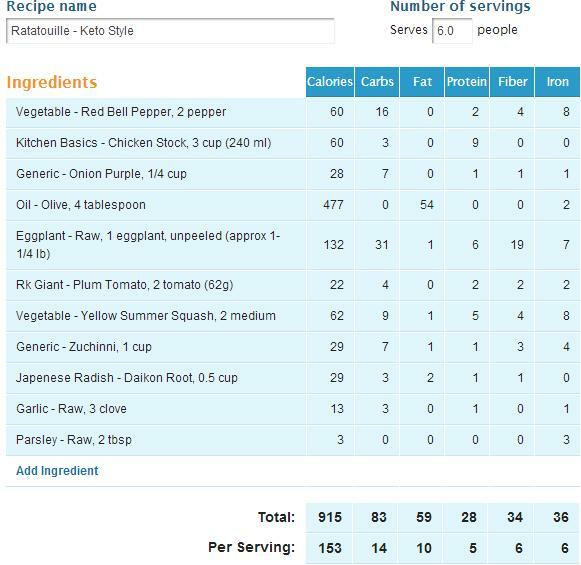 8 net carbs per serving. Parsley is dumb.